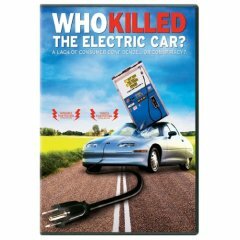 Project 10: Electric Car Project Part 1: "Who Killed the Electric Cra?" · Tagline: In 1996, electric cars began to appear on roads all over California. They were quiet and fast, produced no exhaust and ran without gasoline...........Ten years later, these cars were destroyed. · Plot Outline A documentary that investigates the birth and death of the electric car, as well as the role of renewable energy and sustainable living in the future. Plot Synopsis: With gasoline prices approaching $4/gallon, fossil fuel shortages, unrest in oil producing regions around the globe and mainstream consumer adoption and adoption of the hybrid electric car (more than 140,000 Prius' sold last year), this story couldn't be more relevant or important. · The foremost goal in making this movie is to educate and enlighten audiences with the story of this car, its place in history and in the larger story of our car culture and how it enables our continuing addiction to foreign oil. This is an important film with an important message that not only calls to task the officials who squelched the Zero Emission Vehicle mandate, but all of the other accomplices, government, the car companies, Big Oil, even Eco-darling Hydrogen as well as consumers, who turned their backs on the car and embrace embracing instead the SUV. Our documentary investigates the death and resurrection of the electric car, as well as the role of renewable energy and sustainable living in our country's future; issues which affect everyone from progressive liberals to the neo-conservative right. While watching the movie, make notes on the Film Note Outline document. Then after watching the movie, write a paper about the movie, highlighting the points which had the greatest impact on you. One Film Note document there are some questions you should try to answer in your paper. In the final minutes of the film, the documentary uses a guilty/not guilty analogy for each of the major points in the film. Include these with at least one sentence describing this category of evidence present. Who is Stan OVSHINSKY? Include research about his batteries and the solar shingle he invented. (Watch the deleted scene too!) (Read the other links provided on the note page. Is there a next step toward gasoline independence, and conclude with suggestions which might solve our personal transportation problem.